As part of our weekly Startup Spotlight we profile Mobacar. KERRY-BASED TRAVEL TECH startup Mobacar will soon roll out software that can predict the type of hotel a holidaymaker will book. Founder Mike Webster tells Fora that the fast-growing firm has raised about $10 million to date for its artificial intelligence technology, which is already used by travel companies to predict the mode of transport a customer will prefer when they’re buying flights. 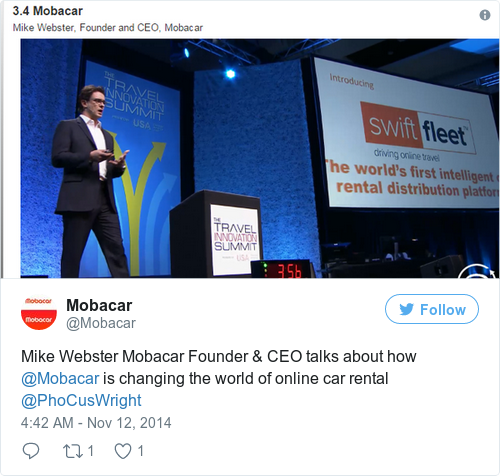 Mobacar’s AI software is used by major travel groups around the world, including multibillion-dollar e-commerce system Travelport and Australia’s biggest online travel agency, Flight Centre. The three-year-old startup was spun out from financial services firm Fexco, where Webster worked for seven years. The old service – called Nova Car Hire when it was part of the much-larger company – was basically an online car rental brokerage with a staff of 10. “When I took over the business, it was very close to profitable,” Webster says. ”But we plugged out the revenue. It was effectively bad revenue that was never going to do anything for us. Webster says there was no eureka moment for Mobacar. The idea to develop AI technology for the travel industry was a slow-burner sparked by conversations with a maths lecturer. “We knew that ultimately e-commerce was misfiring and that the days of giving people catalogues of things to search through were going to go,” he says. Webster and the Mobacar team set about trying to build a system that could predict what mode of transport customers wanted instead of giving them an endless stream of transfer options from an airport. The company developed its own car rental platform first, before making standalone AI software that can be plugged into other systems. For that reason, Mobacar sees itself as an AI company that’s competing with tech titans like IBM Watson and Adobe. Webster says the company’s expertise in the travel sector sets it apart from the competition. He says the proof of Mobacar’s might is its deal with Travelport. The most recent accounts for Mobacar show that the company made a loss of nearly €375,000 for the financial year ended 31 December 2016, pushing accumulated losses to almost €2.5 million. However, Webster says the company has been “sustainably profitable” month-on-month since January of this year. He says Mobacar has raised $10 million with Dublin venture capital firm Delta Partners as its main backer. Two years ago, Mobacar was valued at €20 million – but Webster says he didn’t care about that at the time. “Up to a certain point, you have to ignore all that stuff. My main aim is to make sure that the business grows and that the people on our team have good careers. When asked whether travel companies have looked to acquire Mobacar, Webster says the firm was approached by three potential buyers last year. While he was “semi-curious” about the offers, Webster has no intention of selling the business yet.